I don't know when this broke exactly, but if I put my Windows XP SP3 computer into standby (close the lid) and then resume it, from that point on NIS 20.2.1.22 things my compter is idle even when it's not. As such it is kicking off "idle" background processing when I'm actively using my PC. In order to get idle detection working again, I need to reboot my PC. This is a relatively new problem as I've only seen it under NIS 20.2.0.19 and NIS 20.2.1.22. It looks like it started some time within the last month as you can see that Norton believed my computer was idle for 2 weeks straight (except when the computer was off). If this keeps up, I'm going to have to remove Norton since when it's doing it's idle processing, my computer is unusable. I'll check back later as your images are not yet visable until a moderator OK's them. Have you checked your power settings in Windows? 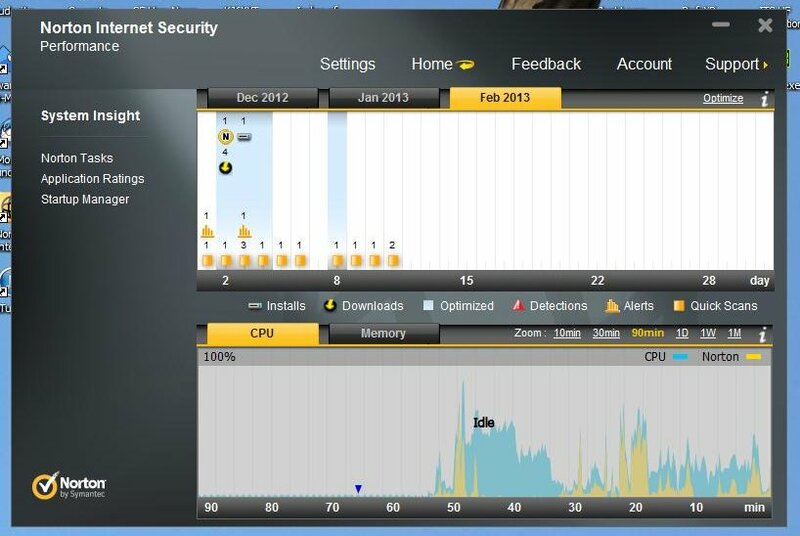 If your system just goes to 'sleep' or hybernates when you close the laptop, Norton will see this as being idle. It doesn't matter if Norton thinks my system is idle when in standby,it shouldn't think it's idle when I'm actively using my machine. I decided to run the Norton Removal Tool and reinstall. The Norton removal tool seems to have hung though as it's been sitting at the "Processing MSI's by Product Code" stage for the last 15 minutes with it's task using 97% CPU. How long should it take? Having recently used that, yes, it does tend to take that long in that stage. Okay, I removed and reinstalled and it installed 20.2.0.19. I ran live update, t before I restarted, I closed the lid and waited about 15 minutes. When opened it, Norton identified the system as having slept and now being active, so that worked. I then tried seeing what would happen if I closed the lid, while Norton said the system was idle. I changed the idle time to 1 minute so I wouldn't have to wait. I waited a few minutes and opened the lid and Norton showed that the system was idle that entire time (instead of being in "sleep" like it did before), but detected the system went active. I'm not sure why Norton showed "idle" as opposed to "sleep" this time, but it may have had with do with leaving the Norton window open, the shorter sleep time or that I had just resumed from standby a few minutes prior to going into standby again. I rebooted my PC to install the live updates. I was still on 20.2.0.19 so I ran live update again to see if it would update me back to 20.2.1.22, but it didn't. I'll need to keep an eye of it some more. Please run LiveUpdate (rebooting when requested) unitl LiveUpdate responds with the specific words :no updates found" - you are not completely up to date until you see "no updates found". I've already done that. I've even rebooted a few times for good measure. Have you seen this? Not one that looks like this but this specific one. Yes that is the screen I see. Also if you are positng in this thread, please make sure it is about the problem I'm having with Norton not detecting when my system is no longer idle. You commented you were trying to get back to 20.2.1.22 and Yank was just trying to help you do that. How did you get 20.2.1.22 originally? Was it just through LiveUpdate, or did you email Tony for the download? The probable reason for your original issue is a corrupted download or update to your Norton product. Your reinstalling seems to have solved this. Norton originally updated to 20.2.1.22 on it's own. I didn't do anything special to get it. Also I'm not 100% sure reinstalling fixed this. I'll need to watch it. I did notice after reinstalling the idle Quick Scan didn't run on it's own, so I uninstalled, ran NRT and reinstalled again, QuickScan still isn't running, though the other processes are. On a side note, NRT does something weird since every time I run it, my HP printer software wants to reinstall. I have seen one or two other users that have mentioned the HP printer getting removed. I'll see if I can pass this on. Technically the printer isn't being removed, but when doing things after NRT, I get a Windows Installer popup telling me certain HP programs are being installed (for example TrayIcon, Web Smart Print, etc). I had to go find the original CD that came with my printer to complete the install since if I canceled the install, it would open again the next time I restarted my PC or opened any folder. It looks like NRT is somehow flagging the HP programs as needing to be installed even though they already are. It's not a big deal if you have the CD. If you don't it becomes problematic. Back on the original topic, I have no idea whether re-installing worked or not, because now Norton isn't detecting when my Computer sleeps. I closed the lid last night and when I opened it this morning, it immediately kicked off the background processing (Ran Live Update and did a Quick Scan), but that's because it thought that the computer was idle when I first resumed it from sleep. Once I moved the mouse around it went active. 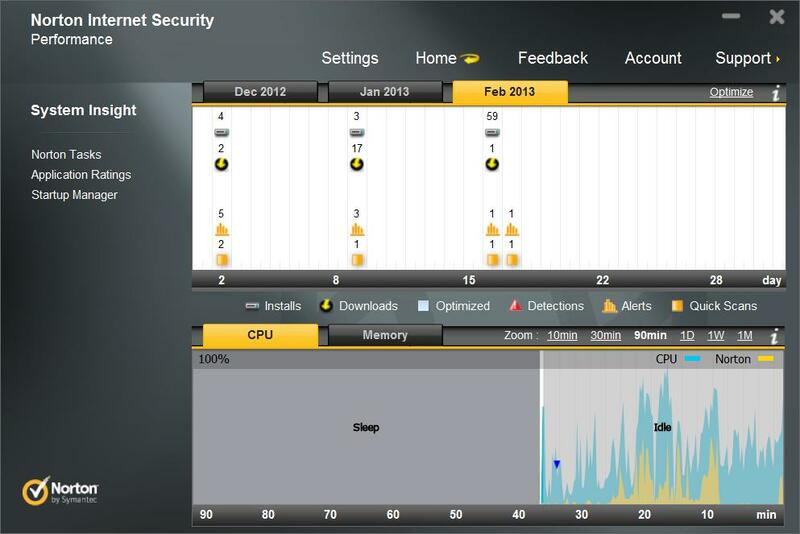 For the entire time it was "sleeping", Norton shows it as being active with "No Activity". So it went from detecting sleep, but getting stuck in idle after resuming from sleep, to not detecting sleep at all. I guess this is better since now it only ignores the setting to wait 10 minutes after resuming from sleep to do processing. Before it was just kicking off idle background processing whenever it felt with. I can deal with a few minutes of annoyance after resuming my PC from sleep. I still need to see what happens if Norton properly detects my PC has went to sleep and see what it does when I resume. This may be a Windows problem. It may be the way Windows is reporting the information to Norton. Try opening a command prompt, CMD with administrator privileges and type 'sfc /scannow' without the quotes. See if this finds anything. I updated back to 20.2.1.22 today and now Norton is reporting the "idle" time that occurs when the computer is sleeping as "Computer Off". It actually changed from "Idle" to "Computer Off" in the performance window after I rebooted to install 20..2.1.22. I have yet to see if the problem will return with 20.2.1.22 installed or not. It detected my computer as "sleep" when I slept it last night and it didn't think it was idle when it was resumed so it looks to be working. At least it did once. What has been determined that causes this problem... NIS2013 (20.2.1.22) under performance thinks my system is always IDLE ? My system is not IDLE I am using it, but this display never changes and contiunuosly shows IDLE? I just upgraded from NIS2012 to NIS2013 last week, and I thought everything was working well after the upgrade. while I am using the system. Here is a screenshoot from my system. I ended up fixing the issue by completing uninstalling without saving current settings and reinstalling. It's not 100% fixed as frequently Norton detects sleep as being either active or idle, instead of "Sleeping", but it's no longer detecting active as idle as far as I can tell. It no longer runs its background tasks (other than automatic live update and quick update) when I'm using my system. I wish Symantec would warn users of this issue before we try to do a online install over a prior version of NIS! Now I have to use the dreaded NRT, and since I run NG + NU on this PC those will be removed at the same time....wasted time! Just update me on this sequence...and do I use my current active USER code for my NIS2012 since I still have time on that code. Where online are the links to download full versions of NIS2013, and the current NRT? If you do uninstall, I recommend uninstalling normally. I tried running NRT without uninstalling and it hung. i think there's a bad setting from NIS 2012, that gets pulled in to 2013, so you can try uninstalling NIS and choosing to not keep your settings (if you use identity safe, back that up). I reinstalled from the download link in Norton Account. next couple of days. No uninstall or reinstall planned right now. I rebooted my computer yesterday for the monthly Windows update. I then slept my computer last night. When I was using it this morning, my hard drive started thrashing and I saw the ccsvchst.exe process was using a lot of CPU. At this point my PC was next to unusable. I checked the Norton Performance window and sure enough it showed my PC had been Idle the entire time I was using it. To get Norton to stop doing stuff, I had to turn on Silent Mode. This really needs to be fixed and Norton is doing all it's idle processing when I'm working on my machine, killing the performance. A simple reboot did not solve this problem for me, but a complete shutdown & shutoff of the compter did. I restarted again and it appears to be working again. Obviously though it's an intermittent problem. Once it occurs, only a reboot fixes it, but sometimes a reboot causes it. On a side, I'm fairly certain NIS preventing my PC from automatically going into Standby after 20 minutes like it's set to do. For the first time in a very long time yesterday it did so, but only after I rebooted to fix the idle issue. Did you restart or do a completely cold start as suggested by botayota? Both times I did a simple restart. The first time Norton thought my PC was idle after I slept it and resumed and started using it. I restarted again and that tiad, after sleeping and resuming, it correctly indicated my system was active. The only difference between the restarts was that the first one was done to install Windows updates. The second one was done because Norton kept trying to run background tasks while I was actively using my machine. Download the newest version patch of NIS2013, this will then ask you to reboot your computer, but instead do a shutdown. Let the computer sit for a couple minutes powered down, then restart. I noticed tonight some issues with the performance window until I applied the new version patch and did a shutdown & restart. Now all looks fine again. We are looking into this issue internally. I will get in touch with you via Private Message if I need additional information. I will update this thread once I have more updates to share. Thanks for your patience and continued support of Norton! It is good to know you are actively looking into this issue, since I have experienced it also. mode, then NIS2013 only shows IDLE in the perfomance tab. It's good to know this is being looked into as it really annoys me. I wish I could figure out why it happens sometimes and doesn't others. Turned off machine (shutdown completely). Used it for awhile. Automatic updates and other non-idle tasks ran. Idle quickscan started to run when my machine went idle briefly, but stopped when I started using my machine. Closed the lid of my laptop which puts it in Standby state where everything is "off" except the RAM still gets power so it can resume quickly. Opened lid the next day and laptop resumed. I briefly checked the Norton Performance chart and it correctly showed as having resumed from "Sleep" and was active. I left my machine alone for about 70 minutes and came back and worked on it for 10 minutes and checked again and it showed that except for the brief minute of being "active", it detected my PC as being "idle" (see attached screenshot). Rebooting corrected this, though I'm not sure what will happen the next time my laptop goes into standby as that seems to be a crap-shoot. And it happened again. After the reboot from the previous post, my laptop automatically went into Standby. I resumed it today, about 19 hours later and it showed that it went idle, then was in Sleep until I resumed it. At that point it briefly showed as being active, before permanently showing as idle. This is really annoying since idle tasks interrupt what I'm doing. I've turned off all idle tasks except for insight and quickscan since they can't be disabled. Currently I'm waiting for qucikscan to finish so I can actually use my computer. It's now happening every time my machine goes to sleep, which means I have to reboot any time my machine sleeps. Right now it's running Automatic Live Update, Norton Community Watch, Norton Insight and Quick Scan all at the same time while "idle". Needless to say trying to type this message is difficult as the letters appear a few seconds after I type them. I think this might be related to how long my machine is in standby. Brief "naps" don't seem to trigger this. I primarily see if after sleeping my machine for 24 hours or so. Unfortunately once it occurs, the only fix is to do a reboot. I'm pretty sure this is the pattern. Lately I've been rebooting my machine and sleeping it overnight and constantly running into this problem. The other day after I rebooted to fix the problem, I slept my machine for about 5 seconds and resumed and it was good. I then slept it overnight and ti was fine the next day. So it appears that any time I reboot, I need to sleep my machine for a few seconds. After that it will be fine until I reboot it again. If I don't do that and it sleeps to long, it gets stuck in idle mode. Also this is still happening here also. I awoke my PC from sleep, and then NIS2013 thought my PC was in IDLE, so a window popped up NIS is performing a background scan because you system is in IDLE. I was using my PC and NIS2013 kept on scanning in the background, and when I brought up the Performance window it showed my PC was in IDLE mode...wrong!!! I shut of my PC completely, and then restarted, and now NIS2013 shows my PC is not in IDLE. Not sure if running CCLeaner could cause a loss in NIS2013 recoginizing the state my PC is in? I run CCLeaner about 3 times a week. It's not CCleaner since I never run that. It's a bug in Norton. I think it's actually been around for years. I'm currently working around it by briefly sleeping my machine and then resuming it after I reboot it. This seems to prevent Norton from incorrectly thinking my PC is idle. It also seems to cause Norton to not recognize that the machine is sleeping at all, but that's a minor issue. The only other downside is it also seems to prevent my machine from going to sleep on it's own, but it actually did so today, so I'm not sure about that. It did take several hours to do so though, when I have it set to do so after 20 minutes. It's still broken and my work around stopped working. I rebooted my machine to install the latest Windows updates and after sleeping it for a few seconds and resuming, Norton now thinks it's always idle again. Now I have to reboot again. I don't understand why this is since it obviously knows I moving my mouse around and stuff like that. Although not specifically noted as one of the fixes, keep trying LiveUpdate until you get the patch to version 20.3.1.22. When you get the update, let us know if it did help. I'm already running the later version that Live Update gives me. I'm not home so I can't check whether it's 20.3.1.22 or not (as that hasn't been released to everyone yet), but when I ran LiveUpdate the other day it said there are no updates. Any progress? I'm still seeing this. I've been hit by it the past few days. Yesterday, I rebooted, slept for a second and then resumed and everything was good, but then when I woke my laptop today after sleeping overnight, it thought it was idle again. I didn't see it mentioned; are you running 20.3.1, or an older version? I've sent you a link to download 20.3.1, if you'd like to try it out. Thanks. Hi, Tony. With the release of Video Drivers that support Optimus or Enduro technology - especially when dealing with Laptops - the NIS/NAV idle-mode-detect process has a whole new layer of abstraction - which must be negotiated successfully - for idle-detect to work properly. The issues mentioned in the link below may have something to do with the problems mentioned in this thread. I'm pretty sure it's not related (or at least not in my case) as I don't use a screen saver and I'm not running Optimus or Enduro drivers. My laptop is too old to support those anyway. NIS's Idle/sleep detection simply seems unreliable in general. Sometimes it shows my laptop as "Sleeping" when it's in standby, other times it says it was active the entire time in standby, other times idle. I primarily run into the idle detection issue when NIS thinks the computer was sleeping as it will show as active briefly after resuming and then switch to saying it's idle and stay there. If NIS doesn't believe the computer went to sleep, the problem usually doesn't occur. These aren't hard fast rules though as I've seen it successfully recover from "sleeping" and unsuccessfully recover from "active" standby. Hi, Morac. Whether you use a screen saver (or not) is only partially relevant to the issue. There are two levels of sleep management involved. The first is for the stage where the Screen Saver is active (this one is optional). The second is for when the screen is disabled (backlight goes off). The second is a power-management-event, regardless of whether a Screen Saver is activated. So, regardless of the presence/absence of video-related sleep issues - what you describe in your originating post is a Power Management issue. This is the hardware/software/OS subsystem that controls what Windows "sees" as far as hardware is concerned - as well as what is "awake", what is "asleep", what needs to "wake up", what needs to "go to sleep" - and finally "what does the OS need to remember so that when it comes back out of sleep, it can return the hardware to the state it was in when the OS put that hardware to sleep?". If any of the "wake up" procedures fail - NIS/NAV (which is a complete slave to the OS in this regard) can only "react" to the Power Management Events that the OS presents for NIS/NAV to "sniff". It is very common, even in older non-Optimus or non-Enduro video drivers - for there to be power-management bugs - as well as other bugs in the System Tray Control Panel Application which cause problems with restarts after LiveUpdate events. Bugs which can mess up the relationship between the reality of power management found in the hardware - and the reflection of that reality in what the OS is presenting to its subsystems. Missing power-management-event when the system returns from idle? NIS/NAV has no idea it's supposed to "wake up". 1. Are you running the latest BIOS for your laptop? The first and most fundamental aspect of Power Management is BIOS support. If that is wonky - everything else on top of that is working with incorrect or invalid data. 2. Are you running the latest Power Management utilities from HP for your Laptop? All Laptop manufacturers have endless problems with their Power Management utilities. The Laptop manufacturers often get "surprised" by Microsoft Updates that break their Power Management linkages - leading to the need for updated software that works properly now that Microsoft have closed the security holes which older versions of the Laptop Manfactuer's Power Management Software were exploiting to keep track of the link-and-power-status-state of the various hardware/software subsystems. 3. Are you running the latest Drivers for your Hard Disk controller? Again, this is a critical issue because the Hard Disk controller is one of the critical items that must send the proper "wake up" signals to all the various subsystems - and to all the various software on your Laptop - when the system resumes from sleep. This has gotten much much more complex since Sandy Bridge - and there are "gotchas" that can only be fixed by a combination of the latest AHCI/RAID BIOS inserts in the BIOS itself - as well as the latest AHCI/RAID Hard Disk Controller drivers - before all the hardware subsystems and Windows software subsystems "straighten out and fly right". 4. HP, Sony and Lenovo all have dedicated "Live Update" utilities for their own native software packages on their laptops. Have you manually run those utilities to completion - and updated your system with all the "recommended' (not automatically installed) pieces of their software that go with the "critical" updates (the ones the utility flags and says download me Now!)? 5. Then there is the whole issue of Video Drivers. HP and Sony are notorious for not upgrading their Video Drivers for their Laptop products - once those products reach active-mid-life (middle of the way through that product's actual sell-date range). And as we know, Video Driver updates do impact power-management - and thus need to be updated far beyond the level where HP/Sony abandon the user to the vagaries of fate. Ditto for the Power Management utilities (although those tend to get upgraded for newer products, where those updates are applicable to older products as well). Note: The above does not necessarily mean NIS is completely blameless in regard to the problems mentioned in your originating post in this thread. It's just that if NIS is working properly - and there are problems as detailed in the above paragraphs of this post - then NIS will react as described as part of the complaints in this thread. Quite correctly so, because NIS is supposed to "follow the lead" of power-management in this regard. Remember the Engineer's Lament: "Nothing is ever simple..."
I am experiencing the issue complained about by the OP. Norton thinks my PC is idle while I am trying to use it, resulting in everything running slow and sticky while Norton does stuff it calls background tasks. This is annoying as it makes my PC unusable just when I want to be using it. This only started after upgrading from NIS 2012 to NIS 2013. I am experiencing this issue with 20.3.1.22 running on fully patched XP pro SP3 on a Dell laptop with the most recent drivers that Dell provide. NIS 2012 was the best ever but I need to get this problem with 2013 sorted out or I shan't be renewing my subscription (on 6 PCs in total). I am surprised to see that the issue was reported several months ago but having read the thread it seems it is still not fixed. Liveupdate says no updates or restarts required - all fully up to date. Please fix this Norton! Here's a new twist. Today the background processes kicked off 10 minutes after I resumed from Standby. which it should for Live Update, but the Norton Task window said they ran while idle and all the tasks ran (including ones that should only run while the system is idle). Tthe Performance window showed that the system was not idle though. So basically Norton is showing the system is not idle, but decided to run all the background processes anyway and said it ran them while idle. Here's a new twist. Today the background processes kicked off 10 minutes after I resumed from Standby. which it should for Live Update, but the Norton Task window said they ran while idle and all the tasks ran (including ones that should only run while the system is idle). The Performance window showed that the system was not idle though. Hi, Morac. NIS has a "safety feature" - which pushes the priority of QuickScan from "Idle" to "Shared" if a QuickScan has not been performed in a timeframe NIS considers a risk to System safety. This is normal and correct. 1. User puts the Computer to sleep, or the Computer goes to sleep due to inactivity. The machine sleeps for 6 hours or more. 2. User touches keyboard, mouse, etc - whatever is required to bring Computer (Eg: Laptop) out of sleep. Computer wakes up. 3. NIS sees that "Live Update" is very much out-of-date - and performs a Live-Update in order to bring the status of the NIS installation up to current operational parameters. 4. Because the Computer has been in Standby or Off for a substantial period of time - it is almost certain that the Live Update performed upon resume will contain an updated set of VirusDefs. 5. Upon completion of any "Live Update" with a set of VirusDefs - NIS will want to run a QuickScan. Because - in this particular case - the QuickScan is also far out-of-date - NIS elevates the priority of the QuickScan from "Idle" to "Shared" - after the Idle Timeout Delay has elapsed - thus the QuickScan runs as a background process when the machine is not idle. This is also normal and correct. 6. Once the machine is in its normal working state, with an up-to-date QuickScan, the next subsequent LiveUpdate Event which contains a VirusDef update (which may be 6 or 7 LiveUpdate cycles down the stack) goes through exactly the same set of checks-for-urgency detailed in item 5 above - and NIS reacts in exactly the same way. 7. If that next set of VirusDef updates occurs within the "safety window" - as far as NIS' monitoring of QuickScan is concerned - the QuickScan will "yield" to user activity as you expect. This is normal and correct. 8. If that next set of VirusDef updates occurs after the "safety window" has expired - as far as NIS' monitoring of QuickScan is concerned - the QuickScan will not "yield" to user activity as you expect. This is also normal and correct. The reason things work this way is because VirusDefs are not useful until they are applied to the System. Thus, if circumstance conspires to force NIS "out of the picture" due to standby/hibernation/silent-mode/whatever - NIS will eventually "run out of patience" with being sidelined - and QuickScan will be promoted from "Idle" to "Shared" mode. QuickScan only yields when a previous QuickScan was performed within the "validity timeframe" that NIS considers to be "reasonably safe". Once that timeframe is exceeded, QuickScan gets "bumped" in priority to the point where it runs - and properly verifies whether the user's System is clean - in order to ensure the user is Secure - regardless of what the user is doing. This is normal and correct. The only way around the above is to establish a "Quiet Mode" scenario where NIS is instructed to defer a QuickScan "no matter what" - until that program is no longer running on the machine. That this is dangerous to System safety should be self-evident. While that's interesting, it's also completely irrelevant. Regardless if QuickScan was being forced to run because it hadn't run recently, which wasn't the case as it ran yesterday (very out of date for QuickScan is a few days), it wouldn't say it ran while idle and neither would all the other tasks. Tasks only report having run while idle if the system is actually idle when the at ask ran. If it was not, the "Ran During Idle" value is "no". My understanding is QuickScan "out of date" priority has been promoted to a shorter timeframe than a couple of days - as part of the latest Engine updates. I don't know the exact value - but I suspect it is now less than 24 hours and maybe less than 12. Considering that I've seen VirusDef updates as often as 3 times a day lately - and considering the virulence of the latest malware - and considering Microsoft's holes in IE over the past few months and the holes in Flash and Java over the past few months have essentially created "open season" for drive-by-shootings when visiting malware-infested websites - I think it is utterly necessary for QuickScan to be rendered "out of date" in our current computing environment far more quickly than a matter of days. There are a couple of reasons why the "Ran During Idle" tag may be incorrect. First, it may occur because the tag is reflecting the previous run of QuickScan and not the current run. 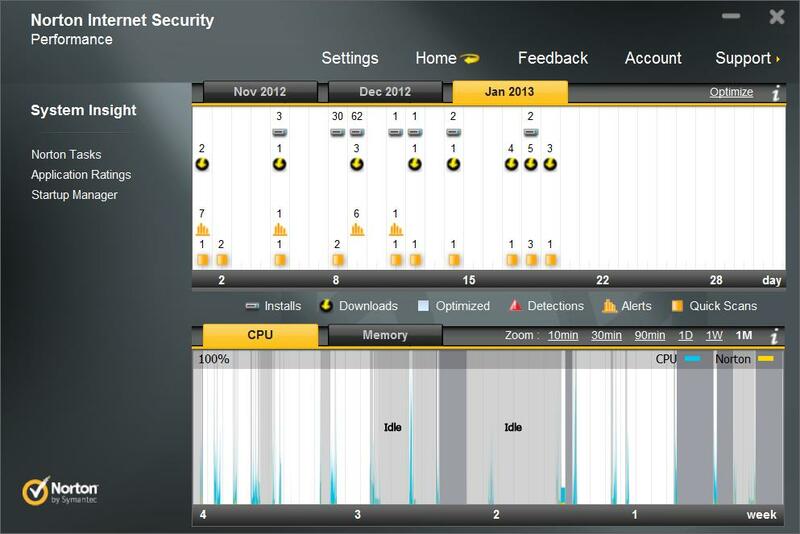 I do not know what mechanism Symantec is using to "keep tabs" on the "Ran During Idle" tag. The mechanism may have changed in order to lessen the NIS CPU load when NIS is "idling" - which may impact how quickly the tag is updated after the current QuickScan has completed. Or, it may be a bug. It's good that you reported your findings here - because if it's a bug it needs attention. And even if it is just "slow status updating" - that should be attended to as well. As per all the other Power-Management "glitches" mentioned in this thread - which seem to be slowly getting sorted out as part of the LiveUpdate process - as well as users understanding the rest of their software stack needs to be right if NIS is going to do its Power-Management gyrations correctly as well - we all continue to monitor the situation and report on our findings. This is good - since holding Symantec to a higher standard of quality assurance seems to be a necessary requirement these days. However, it is still important to understand that Power-Management is a co-operative venture between many disparate hardware and software vendors - and that Device Driver design for this "Post-Sandy-Bridge" stuff is only just coming out of diapers.